The Jewish community in Armenia can trace its roots back nearly 2,000 years to after the destruction of the First Jewish Temple in Jerusalem. Today, the Jewish population in Armenia is approximately less than 100 people. The Jewish community of Armenia dates back almost 2,000 years. Many historians date the arrival of the first Jewish settlement in Armenia back to the destruction of the First Temple. During the conquest of King Tigranes II the Great, Tigranes brought with him 10,000 Jewish captives to Armenia when he retreated from Palestine, because of the Roman attack on Armenia (69 B.C.E.). By 360-370 C.E., there was a massive increase in Jewish Hellenistic immigration into Armenia; many Armenian towns became predominately Jewish. During this period, however, the Persian Shapur II began deporting thousands of Jews to Iran. Halakhic studies never prospered in Armenia, although there are a few references to the region in Jewish Hellenistic sources. During Medieval times, most of Armenian Jewry vanished as a distinct entity in the region, although many historians believe they became a part of the Kurdish Jewry. There is an ancient Jewish cemetery located in the region of Vayots Dzor, in the city of Eghegis, south and west of Yerevan. There are more than 40 tombstones dating back to the 13th century, 16 tombstones with Hebrew and Aramaic inscriptions. Jews from Poland and Persia first began arriving in Armenia in the early 19th century. Since 1840, Jewish settlers established both Ashkenazic and Sephardic communities in Yerevan. Up to 1924, the Sephardic synagogue, Shiek Mordechai, was a leading institution among the Jewish community. During and after World War II, hundreds of displaced Jews moved to Soviet Armenia. The Jewish population of Armenia grew to approximately 5,000 people. In 1959, the Jewish population peaked in Soviet Armenia at approximately 10,000 people. Another wave of Jewish immigrants arrived in the country between 1965 and 1972, mainly intelligentsia, military, and engineers. These Jews arrived from Russia and Ukraine, attracted to the more liberal society. Today, the Jewish community has fewer than 1,000 citizens due to emigration and assimilation. Between 1992 and 1994, more than 6,000 Jews immigrated to Israel because of Armenia’s political isolation and economic depression. In 1995, the Chabad House was established in Yerevan. The Chabad House provides free meals, offers classes in Hebrew and Jewish traditions, and cares for the community elderly. The rate of intermarriage among Jews and Christian Armenians is very high. In an interview, Rabbi Berstein of the Yerevan Chabad described the Jewish community as “‘too small’ to be of great interest to most Jewish organizations.” Almost half of the Jewish population resides in Yerevan. Seven, Yerevan and Vanadzor have active Jewish community centers. At the start of 2002, Rimma Varzhapetian became the president of the Jewish Community of Armenia. The only rabbi in Armenia is Rabbi Gershom Meir Berstein of the Chabad in Yerevan. In 2004, the Jewish community, through the assistance of Chabad, began producing kosher food. Slowly, the Jewish community is rebuilding itself in Armenia. The American Jewish Joint Distribution Committee (JDC) is very active in Armenia assisting the elderly, through the charity Orot Hesed. The JDC works through the Yerevan synagogue to provide finances for food supplies, fuel, and medicine. This program supports nearly 80 people. 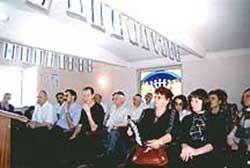 The Jewish Community of Armenia (JCA) in Yerevan also sponsors programs for Jews. In late 2002, the JCA published the community’s first newsletter. The Jewish Agency for Israel (JAFI) maintains a Sunday school, a Hesed senior center, several youth clubs and communal activities in Armenia. The Religious Society of Armenia also supports a second Sunday school and a summer camp, both located in Yerevan. Menorah, the Armenia-Israel culture group, conducts many activities in the community. Modern Hebrew has been taught at the state university since 1995. In 1992, the Jewish Religious Community of Armenia was established in Yerevan. This Chabad organization maintains a rabbi, the third Sunday school in Armenia and a Community Center for programs and gatherings. It also supports a summer camp and charity programs. There are weekly Shabbat services and holiday services held at the Yerevan synagogue. Since 1997, the Jewish Religious Community has published the newsletter, Koelet, to help keep the community informed. There is also a small Jewish community in Sevan that occasionally holds services led by the head rabbi of the Yerevan Synagogue. Historically, Jews and Armenian Christians have had good relations. Both groups have ancient cultural and religious roots in Armenia that have helped them through modern persecutions. Nonetheless, Jews are considered aliens in Armenia and not full citizens. Anti-Semitism does exist in Armenia, although it does not occur frequently. For instance, in February 2002, Romen Yepiskoposyan published an anti-Semitic book. Also the media and local officials initiated a boycott of the Holocaust memorial. Because of Armenia and Turkey’s have poor relationship over time, much of the anti-Semitism in Armenia stems from the good relationships between Turkey and Israel and the United States. The Armenian Jewish community has good relations with their government. 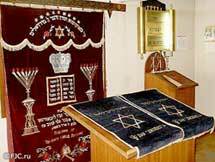 Armenian Jewry may worship and practice Jewish traditions freely due to the 1991 Armenian Law on Freedom of Conscience, amended in 1997, of separation of church and state. In 1996, the state registration agency required every communal organization to register with the state. The Jewish Religious Community of Armenia is registered with the Committee on Nationalities. In 1999, the JCA planted trees in Yerevan in commemoration of the Holocaust and the Armenian Genocide Memorial. A state-sponsored channel broadcasts a weekly television show highlighting Jewish and Israeli culture. The Armenian government has also been cooperating with the Jewish community to retrieve Torah scrolls confiscated in the past and placed in state collections. Israel and Armenia have diplomatic relations; however, neither maintains an embassy in the other country. Israel is represented in Armenia by the Israeli ambassador in Tbilisi, Georgia. Yad Vashem, the Holocaust Memorial in Israel, has paid tribute to ten Armenians as “Righteous Among the Nations” for risking their lives during the Holocaust to rescue Jews. In 1988, Israel Defense Forces were sent to Armenia after a devastating earthquake. Over the past years, trade between Israel and Armenia has further increased the two nations’ friendship. Since 1989, 1,246 Jews have immigrated to Israel from Armenia. “Armenia,” The Jewish Travelers' Resource Guide. Feldheim Publishers. 2001.